Definition at line 259 of file Dominators.h. Definition at line 265 of file Dominators.h. Definition at line 276 of file Dominators.h. Definition at line 269 of file Dominators.h. 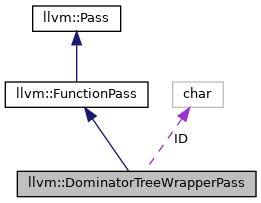 Referenced by llvm::getBestSimplifyQuery(), llvm::StackProtector::runOnFunction(), llvm::LazyValueInfoWrapperPass::runOnFunction(), and llvm::DominatorTree::viewGraph(). Definition at line 270 of file Dominators.h. Definition at line 375 of file Dominators.cpp. Definition at line 280 of file Dominators.h. 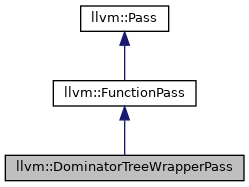 References print(), and llvm::DominatorTreeBase< NodeT, IsPostDom >::releaseMemory(). Definition at line 368 of file Dominators.cpp. References assert(), llvm::codeview::Basic, llvm::JumpTable::Full, and llvm::VerifyDomInfo. Definition at line 263 of file Dominators.h. Referenced by llvm::SafepointIRVerifierPass::run(), and llvm::DominatorTreeVerifierPass::run().